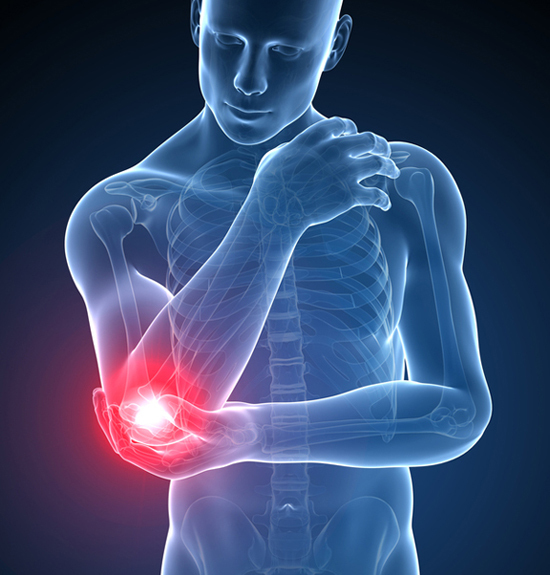 Anyone who regularly lifts, reaches, pushes, or pulls can sustain tennis elbow or golfer’s elbow. Tennis elbow? Golfer's elbow? Both can be painful; we explain the difference. Lateral epicondylitis, the medical term for tennis elbow, affects as many as 50 percent of recreational tennis players —most of them in their 30s or beyond—as well as people who don’t play sports at all. 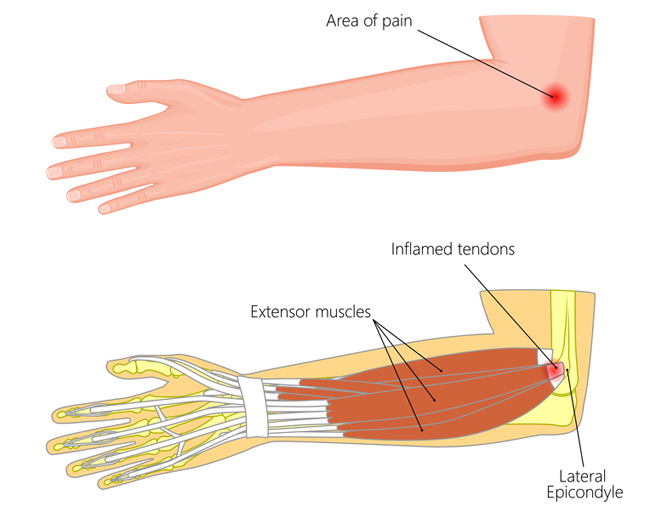 It involves an inflamed tendon where it is attached to the bony, outside part of the elbow (with palm up). Medial epicondylitis is called golfer’s elbow, but the inflammation and pain are on the inside part of the elbow (palm up). Neither condition is likely to cause long-term disability, but both can keep you off the court or course for weeks or months at a time. For most golfers, the problem tends to be on the outside of the non-dominant arm. (The non-dominant arm for a righthander is the left arm.) The pain comes on gradually and might radiate down the arm. It can be nearly unbearable when hitting certain shots, gripping an object, turning a doorknob, or even brushing your teeth. Repetitive stress is the easy explanation for these ailments, but the exact cause may vary from person to person. Some think the main factor is damage to a specific muscle in the forearm (the extensor carpi radialis brevis, not that the term is likely to come up in casual conversation) caused by overuse. The impact between the racket or club and ball causes vibrations that are transferred to the arm. The repetitive contractions of the muscles that stabilize the wrist and hold the racket/club are constantly overloaded. Age, frequency of play, lack of flexibility or strength, poor technique, off-center hits, and grip could all contribute to the condition. The underlying problem is gradual tissue breakdown of the tendons that attach the muscle group to the bone. As people get older, the injury doesn’t heal well and we have to do something to promote the healing response. There are several simple and safe things people can do on their own. Dr. Dimeff suggests cross-massage—rubbing your arm perpendicular to the muscle fibers that run up and down, an inch or two from where it actually hurts (four to five minutes at a time, several times a day). It loosens up some of the scar tissue that has formed as a result of the tissue breakdown process and increases blood flow to the area. 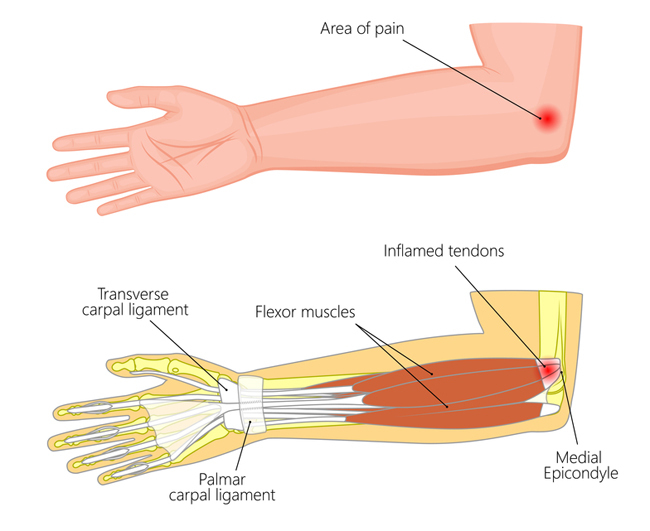 Other self-treatment techniques include wearing a brace that reduces the shock transmitted to the tendon, massaging the area with ice ten to 15 minutes at a time, taking over-the-counter pain medications, and doing gentle stretching exercises that flex and extend the fingers, wrist, and arm. Also consider restringing your tennis racket at a lower tension or changing your golf or tennis swing (with the help of a teaching pro) to minimize the impact of the ball hitting the face of the racket or club. If you’re not making headway within four to six weeks, it’s reasonable to see a physician. Heat, ice, ultra-sound, electrical stimulation, dry needling, and cortisone injections might be prescribed. Cortisone is not a long-term solution. Aggressive and not totally proven methods include prolotherapy (injecting a substance that causes localized inflammation, which stimulates that area of the body to repair itself), and platelet-rich plasma (PRP). PRP is a preparation from a patient’s own blood that contains a high concentration of protein growth factors that are important to the healing process. The research supporting the effectiveness of PRP for tennis and golf elbow is still inconclusive. Another option is extracorporeal shock wave therapy (ESWT), a series of uncomfortable, high-energy, ultrasound treatments with success rates as high as 75 percent in some studies. These are not last resort options but are used when traditional methods have failed. Surgery is the last resort, but up to 95 percent of patients have success with nonsurgical treatment, according to the American Academy of Orthopaedic Surgeons. Gradually increase your activity level, warm up well, stretch, and work to increase your strength. The stronger you are, the more stress you can put on yourself without breaking down. When you’re young, you can play tennis or golf without worrying about strength exercises. But as you age, exercising can become a prerequisite to playing tennis or golf. bone, exercise, inflammation, massage, muscle, pain, protein, strength, stress, tennis elbow.